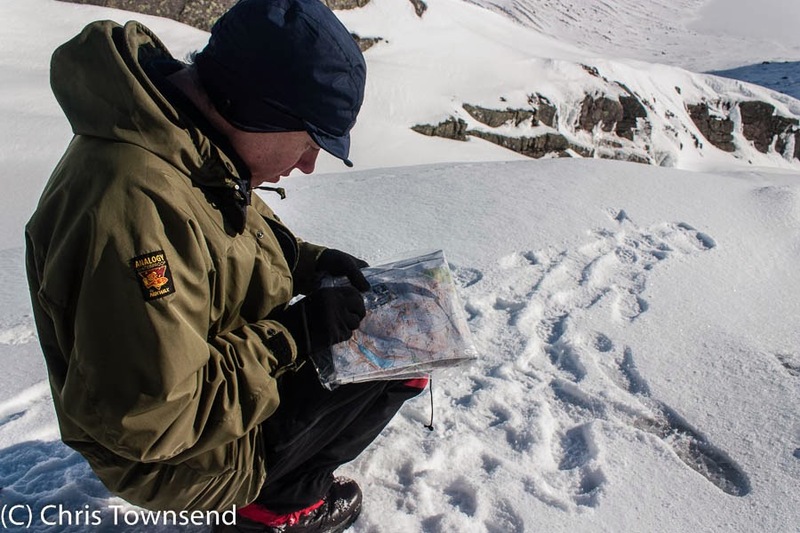 Following yesterday's rather wild ski tour (see last post) I returned to Coire Cas to be interviewed for BBC Radio Scotland's Out of Doors programme about compass declination and navigation in snowy conditions. This should be broadcast on this weekend's programme - 6.30 a.m. Saturday, 11.05 a.m. Sunday. Compared with yesterday the weather was much windier, snowier and wilder. The ski resort was closed due to the weather and the snow and wind blasted car park almost empty. We wandered a short distance and found a shallow defile partly out of the wind for the recording. I'll be interested to hear what the weather sounds like! En route to Coire Cas I had a punctured tyre for the first time in many years. After managing to shuffle into a car park I was pleased to discover there was a jack and a wheel wrench in the boot along with a spare wheel. I hadn't seen any of these for so long I wasn't sure they were there! It took a bit of effort to force the rusty jack to turn and I had to kick the wrench to get the wheel nuts to turn but I did eventually manage to get the old wheel off and the new one on. The car park was in woodland and whilst I wrestled with the wheel two other cars came in with walkers aboard. In both cases the occupants came over and offered help. I didn't need it but it was really good to be asked. Finally moving again I arrived in Coire Cas forty minutes late. Presenter Euan McIlwraith was still there. My thanks to him for waiting. The interview over it was off to my local garage to get a new tyre. Two new tyres it turned out when the others were checked. And a sticking brake pad fixed. At a loose end whilst all this was going on I wandered down to the River Spey where there was some wonderful storm light. A short walk and some satisfying photography later I actually felt the burst tyre had been a cloud with a silver lining - and I had pictures of the latter. I'll post some of the photos tomorrow. Well spotted! I need to get some more navigation photos. That one's been in The Great Outdoors as well.